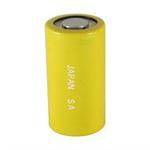 N-1900SCR: SANYO brand 1.2v 1900mAh rechargeable Ni-Cd Sub-C cell. Home > Battery Cells > N-1900SCR: SANYO brand Ni-Cd Sub-C cell. High-output / high-capacity / high-performance battery. 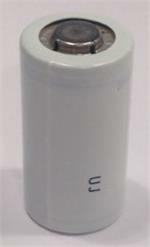 N-1900SCR: SANYO brand 1.2 volt 1900mAh rechargeable Sub-C size Nickel Cadmium Fast Charge cell. Dimensions: 1.655" tall, 0.88" diameter. Weight approximately 1.96 ounces. Choose Plain, or with Solder Tabs ($ 0.25 extra per cell). "Solder Tabs" means one metal strap spot-welded to the cell top(+), and one metal strap spot-welded to the cell bottom (-). These batteries can be Fast-charged or Slow-charged. They are a premium-grade cell; ideal for cordless tools, high-output RC motor packs, receiver packs, airsoft gun packs, etc. For larger quantity purchases (11 cells or more), please call or e-mail us for quantity-specific quotes.